I’ve added a Contact form to the site menu bar, next to the About link. If you need to get in touch with me for whatever reason, and don’t want it to be a public comment, this is the place. 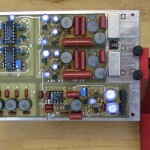 One year ago today, I posted The Plan, the kickoff post both for this blog and for an ambitious DSP transceiver project. My wife had started a blog a few months earlier, and I was her sysadmin. I saw the fun she was having, and soon realized that administering two WordPress sites would not be much more work than administering one. The year since has brought 57 posts and pages about topics ranging from delta sigma data conversion to electronics books for children, but I’ve kept the project emphasis and the full-documentation style. The transceiver vision from The Plan has shifted a bit. 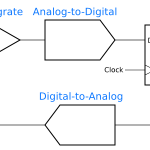 Initially, I planned an FPGA-centered design, even to the extent of building the analog-to-digital (A/D) and digital-to-analog (D/A) converters myself. That work led to a better understanding of delta sigma data conversion and with it a sense of realism about achievable levels of performance in a discrete design. I designed a high-performance A/D breakout board, but soon realized the pace of the project was likely to make me miss next year’s peak of the sunspot cycle and with it the best radio propagation for the next 11 years. I changed my focus to building a transceiver around R2 receiver and T2 transmitter kits that are old enough to vote. That project is still in progress, by the way. The R2’s output amp isn’t working right yet. Thank you for reading. If you are a repeat visitor or an RSS subscriber, a big thank you for that as well. Here’s to more “Electronics, DSP, and Ham Radio”! I’ve added project pages to Skywired. The top menu bar will now list one page devoted to each project I write about on the blog. The project pages will make a one-stop location for getting schematics, layouts, and source code, and they will have a list of posts related to the project, too. The first project page is about the A3PN250 FPGA Breakout Board. It will be joined by others as more projects cross my workbench. I’m excited about the project pages. This is a feature I’ve planned from the start of the blog. I think you’ll find them a big help.